My mom's iBook can't renew it's DHCP lease. So she can't get online to give you an update. I contacted a local Mac expert down in Florida to give her a call. She should be back online soon. The weathermen down here get very excited when they report the weather when it goes below 70 degrees. The other morning I did have to put the heat on, it was in the 40's but by the afternoon it was a sunny 65 degrees. What have I been doing? I've been in the supermarket practically every day. When I get down here the cabinets and the refrigerator are bare. It seems to me that when the markets know the snowbirds have arrived they increase their prices. I guess that's the law of "supply and demand." My Mah Jongg friends are here so we've had a few games and have managed to play outside in the sunshine. 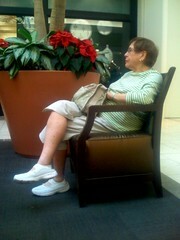 I went to the movies the other day and saw, "No Country for Old Men." It has received rave reviews and has been nominated for a Golden Globe Award. Not in my book! It was a thriller movie and it had my heart beating fast most of the time. The actors did a fine job but there was just to much blood and guts for my taste. And that abrupt ending!! The audience walked out of the theatre not knowing what hit them. If you do see the movie, I'd love to hear your impression. 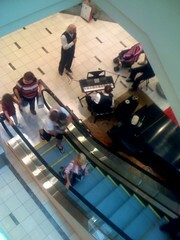 This weekend will probably go see "August Rush." That did not get a great review but I have heard from several friends that it is "a must see movie." Tomorrow going out to lunch with "the girls" and then to a book discussion group at the local library. 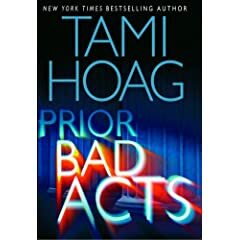 The review will be on "Prior Bad Acts" by Tomi Hoag which I haven't read. Last season I went to several reviews given by Nora Naike and no matter what book she discusses, it's always interesting. Last season one of the books she reviewed was "The Influenza Epidemic" and would you believe, it was a fascinating afternoon. It never fails, every season when I come down here there are changes - stores open, stores close, restaurants open and restaurants close. This season my very favorite sportswear shop has been sold. They have been in business for a million years and will be no longer!!! It was a small shop that gave you individual attention and made shopping for clothes a pleasant experience. Lots of ladies will miss "Flips." Now for a problem that I have - I come down here with a large desk calender with BIG squares. I write LARGE and there just isn't enough room to accommodate what I have to write in that square. The only thing I came figure out to do is to be careful and write smaller. 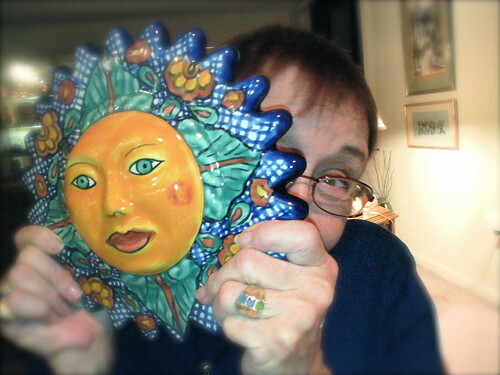 This is Steve here making a guest post on My Mom's Blog! It's really, really warm here. 80 degrees! Before I head back to the snow and Boston, I'd like to tell you about my trip down to Florida with my mom to get her settled this year. 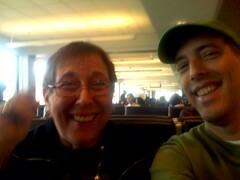 We met at Logan Airport in Boston at the jetBlue gate. I love jetBlue and my mom won't take any other airline down to Florida anymore. It's great! I got an exit row and had even more legroom than usual. 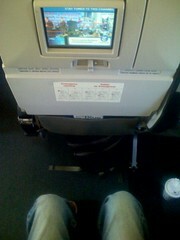 jetBlue has more legroom than the back seat of a Buick! 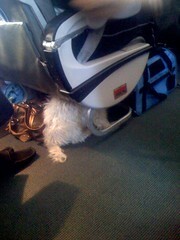 What a dog was doing, sitting under a seat on the plane, I don't know! 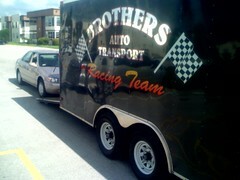 My mom's car was delivered the next morning in a race car carrier! 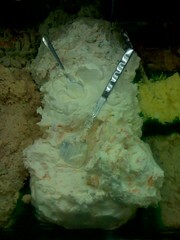 We did some shopping and when we went to the local deli I came across this mountain of cream cheese. They sure do love cream cheese down here. They also love sardines. 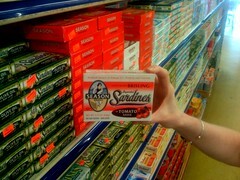 They have a WHOLE AISLE full of sardines! 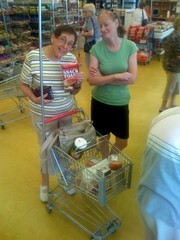 The shopping carts are really small too. 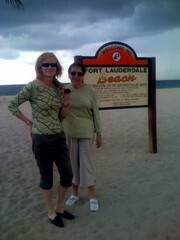 We also went to the beach in Fort Lauderdale. It was pretty cloudy, but it was warm and Carol waded into the ocean. 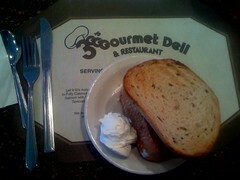 We just had a great breakfast at 3G's Deli. You get two eggs, homefries, toast or a bagel and coffee. Have a great winter in Florida mom! 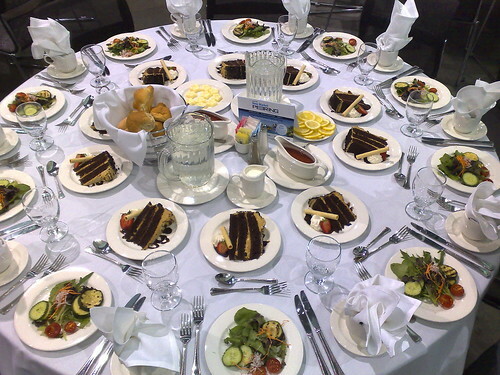 One thing I know I am not going to do when I get down to Florida is, I am not going to one of those seminars that offer you a free lunch! In the past I have gone to those seminars and have had some delicious lunches in some very nice restaurants, but there is a price to pay. It's been interesting to see how different speakers approach the issues and concerns that seniors have. Some are very dull, and some have a great sense of humor and gain your attention by telling you about their families, that way they connect with the audience. "You are all members of the "P" (for procastinators) club, "Information is only as good as what you do with it so let's make an appointment with my firm. What's the best day for you?" My response to that is,"I'm a snowbird and am leaving town soon." Over time I have picked up some helpful information about investing. One thing that I have figured out is, don't invest in something that you don't understand! The salesman doesn't necessarily know what is best for you. It's good for him, he gets a commission on the sale! No more free lunches for me, It's not worth the hassle. This will probably be my last post for a while. Once I get settled, I'll be back on-line with an update on what's going on in the sunshine state. Happy holidays to my readers and fellow bloggers, stay well, stay warm and enjoy!